Emily Dickinson wrote that there is no frigate like a book to take to you to distant lands. With apologies to the Belle of Amherst – there is. It’s called an airplane! We took several (including Air Asia) and executed a reverse Columbus of sorts – starting in the US east coast and headed via Europe to India and Southeast Asia. We met a lot people, ate interesting food, bought local paintings; visited old temples, shiny new malls and infant businesses. Plus spent a lot of money! The education was priceless. We saw the pervasiveness of American products and brands in the lives of simple folks. In many parts of Asia it is commonplace to have a small altar for a family deity or ancestors at your business premises. It’s usually tucked in a corner, almost hidden from view. They are Spartan in simplicity – a few figurines, incense sticks, flowers and a small offering of tea, honey or homemade confections to appease the Almighty. Look at what we saw on a particularly warm day at the altar of a tiny village stall. We visited a Bangalore mall chock a block with weekend shoppers. Kids running around, credit cards getting a workout and junk food everywhere. We stopped by McDonalds to see how quintessential American fast food competes against traditional local fare. They seemed to be holding their own. 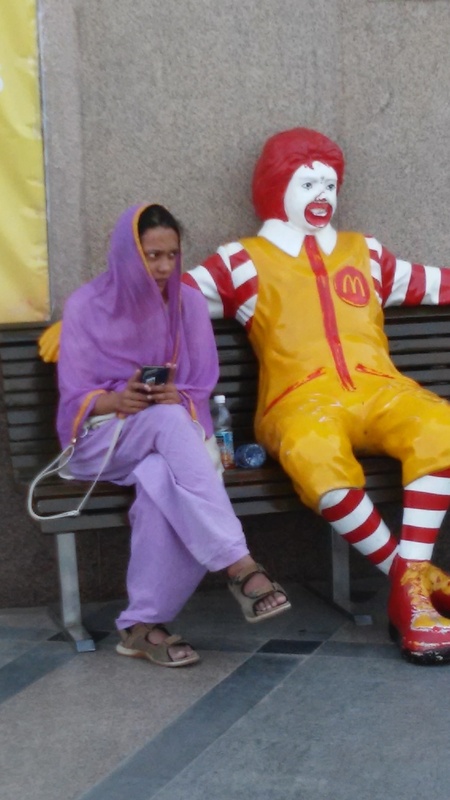 Then we saw this outside the Golden Arches – a traditional Muslim woman sitting next to Ronald McDonald – picture perfect metaphor for global consumers’ relationship with America. They are uncomfortable with the fact that they love American stuff. Consuming American products is a sign of modernity. Even small purchases signal a longing for the global mainstream. But lurking ever-present is the feeling that a hamburger purchase is a blow to one’s own culture and traditions. A built-in bias that global trade and business is a zero-sum game. Even Europeans are not immune to this affliction. The French are probably the most vociferous opponents of American fast food (remember Monsieur Bove’s tractor wrecking a McDonalds drive-thru?). Yet France is the second most profitable market for McDonalds with 2014 sales of over 4 Billion Euros. That was our second lesson – there is a natural contradiction in the minds of global consumers about global (often exemplified by American) products. They love it. But they hate that they love it. We also visited malls in Kuala Lumpur, Malaysia. They are huge! Each one outdoes the other in size, décor, stores and displays. These dizzying temples to consumption made us nostalgic for traditional souks and neighborhood farmers’ markets. By the way the prices are sky high at these Asian mega malls. Americans are better off at a good sale at their local Macy’s. 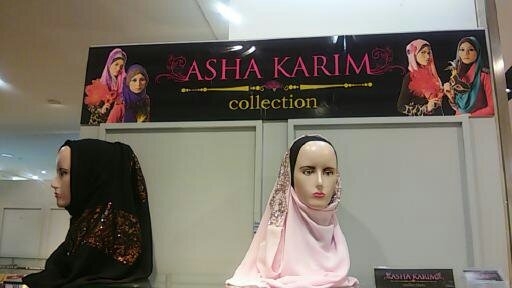 Then we saw this rather unique store – a boutique selling fashionable headscarves for Muslim women (Malaysia is home to 20 million Muslims). And guess what? None of elegant headgear on display was made by Gucci, Ralph Lauren or Dior. Seems like an enormous opportunity lost by global purveyors of style and fashion. What is stopping them? Reticence to explore new frontiers? Afraid of blowback from non-Muslim customers? There are 1.5 billion Muslims in the world (bigger than China) and most of them are regular folks like you and me – they love fashion and love great brands. C’mon fashion houses there is a big market out there. Go and get it.